I’ve been working hard in my studio the last couple of days, and have just about finished the next Peddars Way painting, which I hope to get up on the website tomorrow. I just need to have a final look at it in daylight tomorrow to make sure! 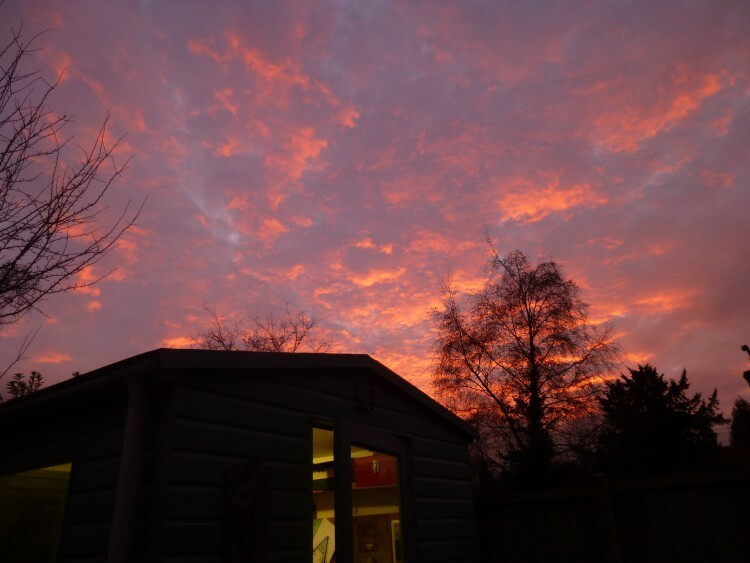 These short winter afternoons mean I often end up painting by electric light – although there are some compensations, like the beautiful sunset above! I was really pleased with how the ARTSTUFF stall went on Saturday – I sold a heap of greetings cards, packs of Christmas cards, a jute bag and a canvas print – and several people said they were sorry I didn’t have any calendars this year! I kept having to explain that I HAD had calendars, but had sold out by November. Which makes me realise that next year I need to make a lot more calendars. Then, on Sunday I had an email via my website which resulted in the sale of ‘Waiting for the Tide II’ to a couple who saw my work earlier in the year at the Sentinel Gallery.